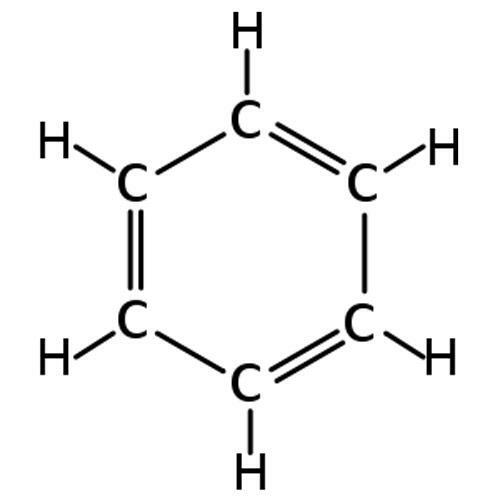 Benzene is a liquid that's colorless, flammable, and has a sweet odor. Benzene is formed naturally from volcanoes and forest fires. Benzene is used to create everything from plastics and lubricants, to dyes, detergents, pesticides, and even some drugs. Originally it was used a a solvent in gasoline because of its ability to "dissolve or extract other substances". While it's generally formed naturally, most of us encounter benzene in our everyday lives, especially those who work in "[the] rubber industry, oil refineries, chemical plants, shoe manufacturers, and gasoline-related industries." We're often exposed to benzene at work, through consumer products, or in the general environment. The highest place of exposure for benzene is the workplace. Benzene has been shown to cause leukemia and other types of cancer. Exposure to benzene can have both short and long-tem effects. Inhaling or ingesting benzene at extremely high levels can cause death. Some studies have shown that long-term exposure to benzene can cause reprodcutive issues causing women to have "irregular menstrual periods and ovary shrinkage", but experts are unsure if benzene was the root cause. It's unknown as to what effect benzene has on a fetus in pregnant women or in the fertility of men.